Final Cut Pro 7 is new released with powerful new features like expanded ProRes codecs, improved speed/XML interchange/media management, etc and some time-saving improvements like automatic transfer, easy export, and so on. However, this new released FCP 7 supports AVCHD with at 1080p 24/25/30, 1080i 50/60, 720p 24/25/30/50/60, so the 1080 60p/50p MTS/M2TS is still incompatible with Mac FCP 7 NOW! So if you want to edit HS700 1080 60p/50p 28Mbps in Final Cut Pro 7, you are recommended to use Aunsoft MTS/M2TS Converter for Mac, which is the superior Mac Panasonic HS700 AVCHD 1080/60p to FCP 7 converter for Snow Leopard. It does not only convert Panasonic 1080 60p/50p AVCHD to MOV on Mac, but also merges 1080 60p/50p MTS files for import into Final Cut Pro 7. Here is the step-by-step guide for you to import and edit Panasonic HDC-HS700 60p/50p MTS to Final Cut Pro 7 on iMac/MacBook Pro with Mac OS X like Snow Leopard. Step 1. Load AVCHD 1080 60p/50p videos to Aunsoft MTS/M2TS Converter for Mac. After transferring .mts files from Panasonic HDC-HS700 camera, run Aunsoft MTS/M2TS Converter for Mac as the best Mac HS700 60p/50p MTS to MOV converter, and click the "Add" button to load .mts videos. Click the "Format" option, and choose Adobe Premiere/Sony Vegas > MOV (AVC)(*.mov) for converting AVCHD videos from MTS to MOV with H.264/AVC as video codec for loading to Final Cut Studio. With this option, the output video will be kept as high definition1920x1080. 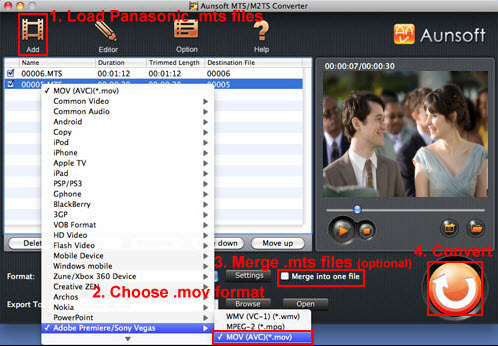 Tick the checkbox for "Merge into one file", and the Panasonic HDC-HS700 1080 60p/50p MTS converter will join and combine the video clips into a single file as output. Step 4. 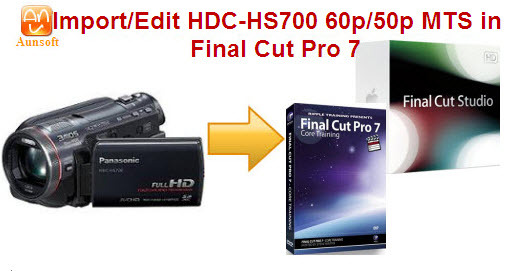 Convert HDC-HS700 MTS to MOV for Final Cut Pro 7. Click the convert button under the preview window, the Mac Panasonic MTS converter starts converting 1080 60p/50p AVCHD to H.246 .mov, and joining the MTS files for editing in Final Cut Pro 7. After converting and merging the MTS files, just import the output files to Final Cut Pro 7 and the video is in HD 1920x1080. You can also import the output videos to Final Cut Express (FCE) 4 for editing in full HD.